Last June, we were given a tip by another parent that our local Elks lodge would help pay for equipment and such that insurance wouldn't pay for. Apparently, their giving of choice is to children with disabilities. 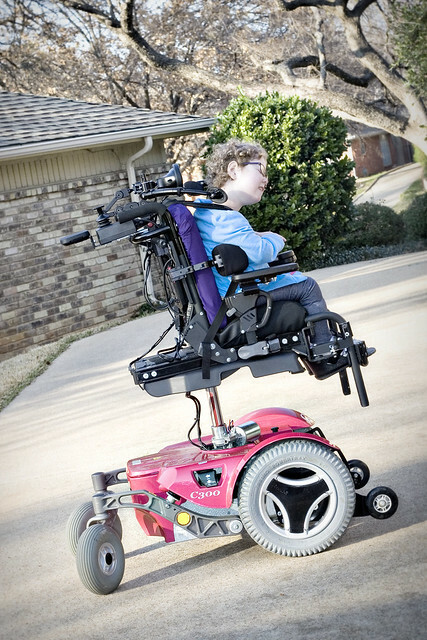 When we ordered Caleigh's power chair we were denied a seat elevator and attendant controls because insurance felt that an, at that time 3 year old, didn't need it. Our wonderful DME dealer actually gave us a loaner joystick to act as attendant controls because believe it or not, a 3 year old doesn't know how to drive a power chair the first time she gets in. So I wrote a long essay about why we felt Caleigh needed those two things on her wheelchair. I got an estimate for the two items. I filled out the long application and sent it off. We got a letter in the mail not long after letting us know that our local chapter didn't have enough money to approve the request. I filed it away and we went on with things the way they were. A couple of weeks before we went to have the Permobil head array installed, I got a call from the main Elks office in Texas letting us know that the funds were available and they would be contacting our DME to have the elevator and attendant controls installed. So both of those things were placed on Caleigh's chair the day we were working on the head array. The attendant controls have helped enormously. Mainly in an electrical way; the real control vs. the joystick seems to be a safer option. The seat elevator allows Caleigh to reach any table height, help us check the mail in the mailbox, reach countertops and be almost as tall as Mommy is. The elevator lets Caleigh be more involved in her community and surroundings. Right now we control the up and down of the chair while she is still learning to drive. We didn't want to add another switch since she just started turning left. One new button at a time, but eventually she will be in control. Many thanks to the Elks for being very generous in donating these items for Caleigh's chair. There are truly amazing people doing selfless acts of kindness everyday. It's humbling and extremely reassuring at the same time.